Here’s your chance to show off your creativity, impressive video-making skills, compelling storytelling abilities, and love for Davao City. 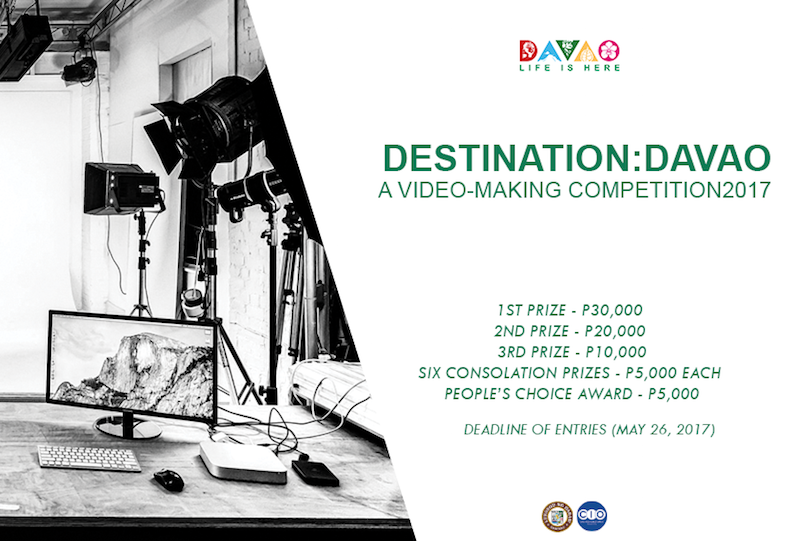 Join Davao City’s “Destination: A Video-Making Competition,” and win prizes. Now on its third edition, the “Destination: A Video-Making Competition,” aims to encourage Dabawenyos and Davao City visitors — whose interests are filmmaking or production of short videos — to come up with original works that depict Davao City as the desired place to invest, visit, or live in, among others. The contest is open to all but students are encouraged to join. The submitted videos will become properties of the Davao City Government. The videos will be used to promote Davao City. Entries can be in the form of short stories, music video, animation, video clip, documentary, stop motion and the like. It should be in digital format, with a minimum resolution size of 720×480, and should not be shorter than one minute or longer than two minutes. A cash prize of P30,000 will be given to the top winner, while P20,000 for the 2nd prize winner and the third prize winner will get P10,000. A People’s Choice award and six consolation prizes amounting to P5,000 each will also be given away.